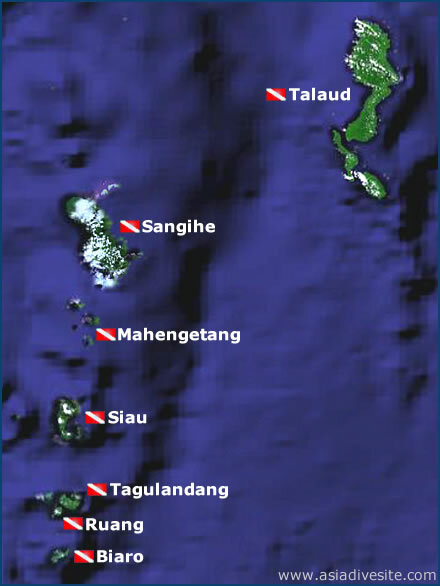 Further north of the Bangka island group lie a number of remote islands, the largest being Siau, Sangihe and Talaud. The chain of volcanic islands connect Indonesia with the Philippines and have deep ocean trenches on either side. Nutrient rich currents flow around the islands attracting diverse and varied marine life. The first in the island chain, recognised by a sheer 200 meter cliff on the southern side is Biaro. A large flooded caldera which is open to the sea on the western side provides a beautiful sheltered spot. Dive sites around the island include Lamango which makes a great shallow night dive, The Labyrinth where volcanic lava flows make up the stunning topography, Sweetlip City which is a 20 meter deep reef with an abundance of Sweetlips, Bomb and Zaccharias Rocks which are submerged pinnacles to the north of the island with stunning coral cover and Kalokoki, a gently sloping reef with colourful soft corals. 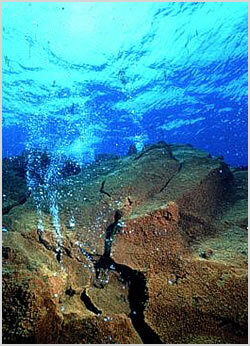 These two islands have a couple of good dive sites and Ruang has two big lava flows that extend sub-surface. Serenade's Secret Point is a sloping reef dropping to a wall with stunning coral growth and plenty of fishlife. Lava Flow has huge schools of fish and black laval rock that makes a stunning contrast to the abundant coral growth and marine life. These tiny islands have an underwater volcano which rises from over 500 meters deep to just below the surface. Several islands have come and gone over the past few hundred years due to volcanic activity in this area. Unspoilt reef gin-clear waters can be found here, yellow sulphur deposits are seen in patches and many of the boulder can be seen bubbling as steam is released into the ocean. Another large volcano comprises the southern end of Sangihe island. Diving here is simply awesome due to the islands remoteness and the crystal clear vizibility, often over 40 meters. A huge variety of marine life awaits with chances of seeing bigger visitors such as hammerheads, rays, reef sharks and dolphins. The northwest of Sangihe has a dive site called Lost City named after a village that was submerged by an earthquake in 1963.